Organizational change occurs when innovative ideas are implemented and translated into the everyday life of healthcare organizations and concerns the involvement of local healthcare professionals. A number of studies describe the resistance professionals can exhibit during organizational change processes (Bloom, 1998; Sehested, 2002). One way of gaining an understanding of this resistance is by investigating the meanings healthcare professionals derive from the implementation process and by examining how meanings can become a driver for involvement in the implementation process, but also by looking at how losses of meanings can become a barrier to involvement. 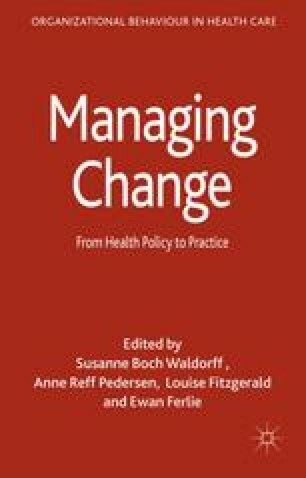 This chapter investigates the contextual meanings of healthcare professionals in healthcare innovation processes. The term ‘meaning’ refers to the storyteller’s creation of meanings from narrative knowledge and narrative practice (Bruner, 1986; Humle and Pedersen, 2014). Humle, D. M. and Pedersen, A. R. (2014) ‘Fragmented work stories: developing an antenarrative approach by discontinuity, tensions and editing’, Management Learning [Online] Available from: http://mlq.sagepub.com/content/early/2014/10/16/1350507614553547.abstract [Accessed October 16th, 2014].